Many birders can recall the thrill of seeing something truly spectacular through a spotting scope. 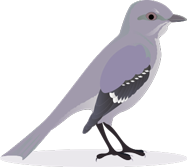 Perhaps it was the sight of a life bird or a regional rarity, or a common bird that was seen in uncommonly crisp detail. Such sightings need not be left only in your memory. Thanks to a growing number of adapters that mate the latest digital point-and-shoot cameras to spotting scopes, you can now preserve those close-up views as digital photographs. Producing such photos is easier than ever. 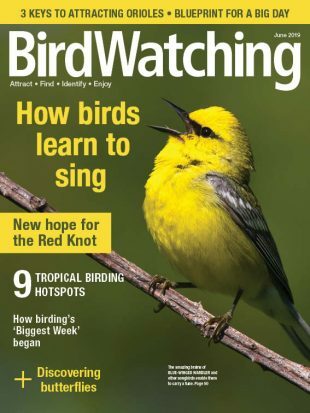 The procedure is known as digiscoping, and for birders who want to try it, there’s even more good news — no photography expertise is required. 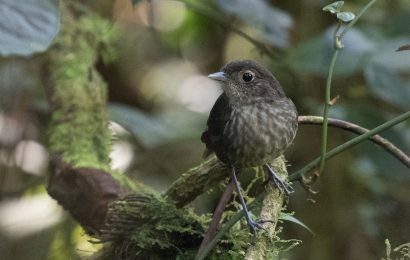 In fact, when it comes to producing beautiful photos of birds through a spotting scope, birders begin with a huge head start, since they already have birdwatching skills and know where birds are likely to be. If only finding the right combination of scope and digital camera were so easy. But with hundreds of scopes and just as many cameras on the market today, this can be a headache. Some cameras don’t work well with scopes, and not all scopes are easy to use with cameras. And connecting the two can be tricky. What’s more, some digiscoping setups make it awkward to switch from spotting birds to taking pictures to spotting birds again. What’s the best way to go about finding the right scope, the right camera, and the right adapter? To find out, we talked to six digiscoping experts: Jeff Bouton of Leica Sport Optics, Laura Erickson, formerly of Binoculars.com, Mike Freiberg of Nikon Sport Optics, Stephen Ingraham of Carl Zeiss Optical, Mike McDowell of Eagle Optics, and Clay Taylor of Swarovski Optik. They identified six essential equipment elements and stressed the importance of technique and fieldcraft. We’ll take a look at the six elements first. A successful digiscoping package, our experts explained, is a chain of six major elements: a camera, the shutter-release mechanism, an adapter, a spotting scope, an eyepiece, and the tripod and head. All must function as a unit when the button is pushed. If only one of the six is weak, image quality will suffer. Mike McDowell, author of the popular online Mike’s Digiscoping Blog, agrees. “I would recommend that you buy as much scope as you can afford. The scopes with ED glass (extra-low dispersion) show less color fringing and anomalies.” McDowell uses a Swarovski AT80 HD scope. He mounts his Leica 77mm APO scope on a Bogen/Manfrotto 3021 tripod equipped with a 3130 head, and he never extends the tripod’s legs fully, since fully extended legs are another source of image-ruining vibration. 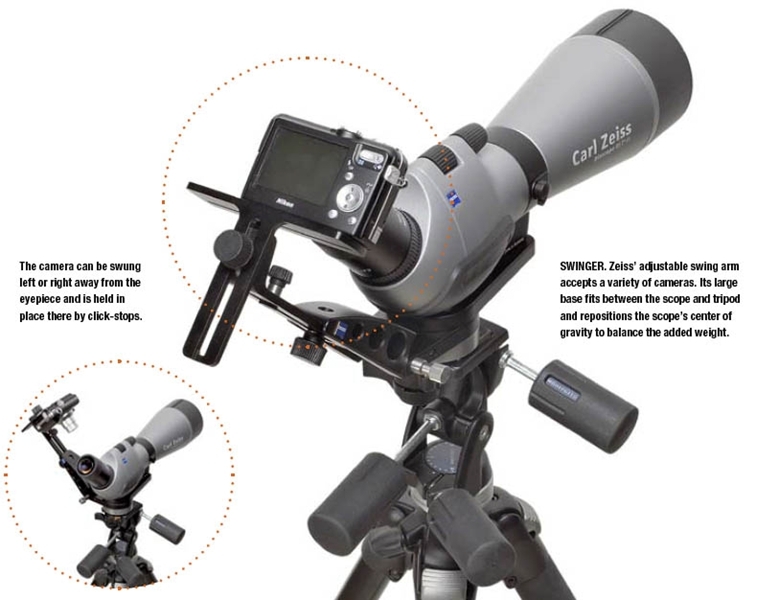 Frequent contributor Laura Erickson recommends angled spotting scopes for the same reason. “I seem to get a steadier hold, and with an angled scope, you don’t need to extend the tripod as high.” Erickson warns further against extending the tripod’s center post, yet another source of vibration. Her scope of choice is a Zeiss Diascope 85FL. And a tripod adequate for spotting birds might not be steady enough for taking photographs. Because digiscoping often uses at least twice the power of the most powerful telephoto lenses, it is best to use the gear favored by professional bird photographers. Most use tripods made by Gitzo or Bogen/Manfrotto and heavy-duty heads rated for far more weight than a spotting scope and camera. 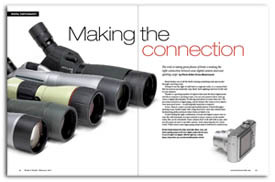 “A fixed-power eyepiece almost always works better than a zoom eyepiece for digiscoping,” says Bouton, “but the vast majority of scope owners have a zoom eyepiece. They work fine, but you’ll get a little less light coming through, and there will be some vignetting.” That is, the dark area surrounding the image that you see when you look through your scope will appear on the pictures you take. A good wide-angle, fixed-power eyepiece eliminates vignetting. The best digital camera adapters might cost more than the camera they hold, reflecting the tough job required of them. A spotting scope with an 80mm objective and a 20x eyepiece projects a circular image (called the exit pupil) that, at best, is only four millimeters in diameter. Exit pupil gets even smaller with a zoom eyepiece or a smaller objective. To make a photograph, the camera lens must be centered precisely over the exit pupil and positioned an exact distance from the eyepiece glass. The camera must not move when the button is pushed. And because birders like to use their scopes to look for birds as well as to take pictures, the adapter must permit users to move the camera in and out of the light path quickly and easily, without losing critical alignment. Mindful of this problem, five manufacturers — Kowa, Leica, Nikon, Swarovski, and Zeiss — have designed adapters specifically for their scopes. Four can accommodate diverse brands and sizes of cameras. Nikon offers a package designed for its own cameras. 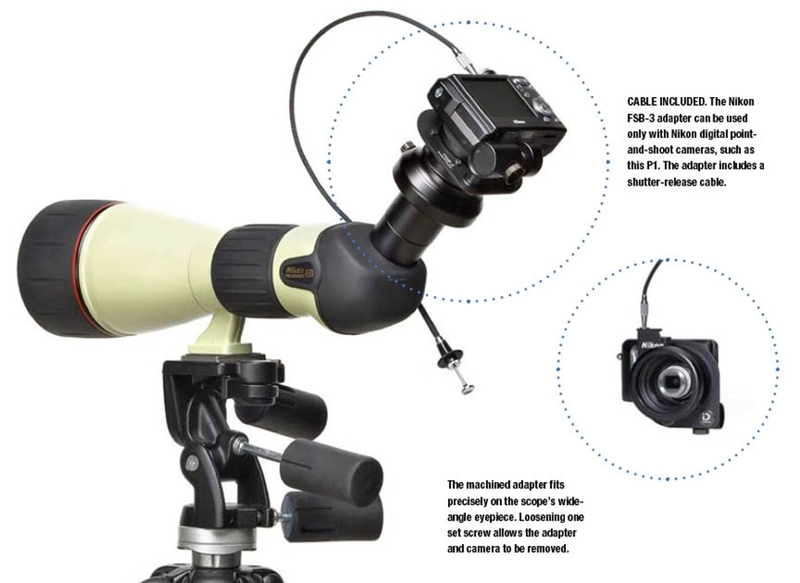 Each adapter provides a firm connection between camera and scope, and each allows users to switch between visual and photographic modes quickly and precisely. Kowa’s adapter threads snugly over the eyepiece. The entire adapter, with camera attached, swings away without disturbing the alignment of the camera. The adapter also has a mechanical cable release. See digiscoping setups for Leica, Nikon, Swarovski, and Zeiss below. All prices were obtained from well-known online retailers. Leica employs a padded clamp to secure the camera top and bottom. The adapter, a long tube that is secured at the base of the eyepiece, is more compact than the other adapters but makes no allowance for a cable release. Nikon offers a proprietary package that is usable only with its branded cameras. The adapter fits snugly over the wide-angle, fixed-focus eyepiece. It comes on and off easily and offers a cable release. The Leica and Nikon systems require birders to remove the adapter and camera in order to look through the scope normally, so birders would be wise to wear a hip pack large enough to hold the adapter and camera while in the field. 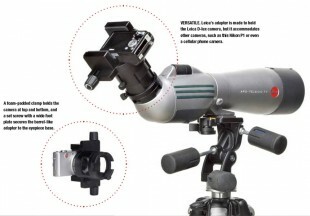 Swarovski’s adapter makes use of an arm that lets users swing the camera up and out of the way with a click of a button. 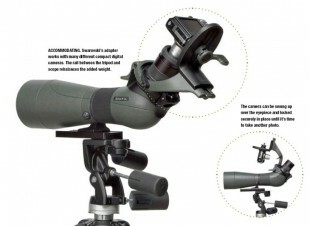 The unit is compatible only with the newest Swarovski spotting scopes. The adapter is well made and locks securely, and it can be removed and re-attached quickly, so the package should travel well during a hike. 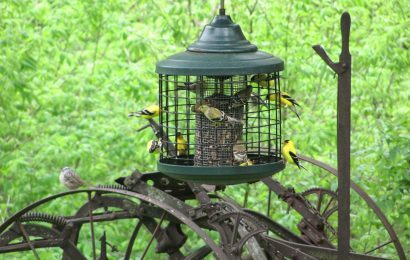 But its bulk does not allow for easy stowing, and birders will have to shoulder some extra bulk in the field when the camera and adapter are attached. There is no accommodation for a cable release. Zeiss employs a swing arm that moves sideways. The adapter attaches to the tripod below the scope. It is the bulkiest and heaviest of the adapters we examined, but it certainly makes it easy to switch between visual and photographic modes. Of course, there’s nothing that says you can’t take pictures without an adapter. All you have to do is hold your camera up to the eyepiece of a tripod-mounted scope and press the shutter release, but experienced digiscopers will tell you it takes practice to get the camera centered accurately. McDowell has been digiscoping for years, and many of his pictures were taken in what he calls crisis mode. 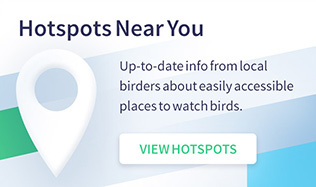 That is, since there’s no way to predict how long a bird will remain in one spot, he’ll shoot while positioning the camera over the eyepiece manually. “If there’s a situation that has to be photographed, I won’t bother with the adapter,” he says. Other adapters, offered by Kowa, Nikon, Swarovski, and after-market suppliers, are tube-like devices that connect to or fit over the scope eyepiece. They attach to the camera via a ring that screws into the filter threads of the camera’s lens. They work well but present a problem: few of the latest compact digital cameras have filter threads. The ones that do are likely to have high-power zoom lenses that are not ideal for digiscoping. Others have become extinct. The Nikon Coolpix 950 and 990 favored by Laurence Poh (see page 34 of the February 2007 issue for more on Poh) and Mike McDowell are long out of production. 1. An optical zoom of 3x or 4x and no more. Higher-power zoom lenses will often make vignetting worse. 2. A big, bright LCD screen. 3. A short lag time. That is, the amount of time between the moments when you push the shutter release and when the picture is actually taken should be as short as possible. A long lag time might result in a missed picture. 4. At least five megapixels of resolution. If the bird is small in the image area or the scope vignettes, the picture will have to be cropped. A camera with a high megapixel count delivers better quality on cropped pictures. If you have a scope and are shopping for a camera, bring the scope into the store and test it with the cameras you are considering purchasing. Keep in mind, too, that many after-market adapters are available. One, namedRadian and sold by Eagle Optics, clamps to the eyepiece and can secure nearly any digital camera to nearly any spotting scope with the required precision. It costs far less than the dedicated adapters offered by the scope makers, but it’s large and it puts a leveraged load on the end of the eyepiece, which is not designed to carry it. A bump or fall could damage the eyepiece or the scope. Birders using the adapter need to take extra care. Even with the heaviest tripod and best adapter, pushing the camera button will shake the scope. In the days of film, most cameras had a socket for a cable release. Using a cable release on a tripod-mounted camera created less vibration and sharper pictures. Unfortunately, today’s digital point-and-shoot cameras lack cable-release mechanisms. Kowa and Nikon have addressed this by including cable-release brackets with their adapters, but Leica, Swarovski, and Zeiss have not. The brackets have a threaded hole into which an included cable release is screwed. When a user squeezes the plunger, the release pin projects through the hole, makes contact with the camera’s shutter button, and trips the shutter. Bouton and Taylor take great pictures without a release. Ingraham uses an aftermarket cable-release bracket from Great Britain-based Eagle Eye Optics. It works with almost any digital camera and adapter but costs nearly $50, including shipping, and the cable release is not included. For under $10, I fabricated an adjustable bracket that worked well when I mounted my digital camera on the Leica, Swarovski, and Zeiss scopes. 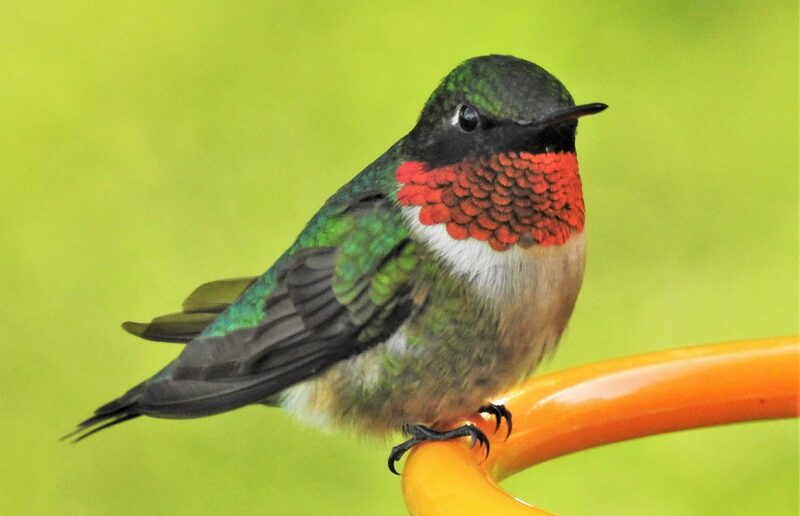 Ernie Mastroianni is the photo editor of Birder’s World magazine. 2. Ready, fire, aim. A digiscoper may not get a second chance at a beautiful picture. “Always take a shot first. Then try to improve on the picture with subsequent shots,” says Bouton. 10. Camera settings are critical. “Put the camera on aperture-preferred or whatever setting it takes to make sure the lens is wide open,” says Taylor. Doing so will allow lots of light into the camera and make your shutter speed as fast as possible. 11. Adopt a hands-on strategy. Mike Freiberg holds the camera’s cable release and tripod panning arm in one hand and works the scope’s focusing knob with the other. That way, he’s ready to take a picture the moment he sees a bird in the field of view. 12. Resist the wind. Even a light breeze will buffet a scope. As a remedy, Freiberg applies a downward force on the scope with his hand while holding the scope’s focusing wheel. Our digiscoping experts: Jeff Bouton of Leica, Laura Erickson, formerly of Binoculars.com, Mike Freiberg of Nikon, Stephen Ingraham of Zeiss, Mike McDowell of Eagle Optics, and Clay Taylor of Swarovski.